Aircel is the best 3G service provider now in India. Aircel is also looking for its 4G services which will be out soon. It has been modifying its tariff as per the requirement of its users. And now it has given a brand new offer for college students to call anywhere with just 5paisa/call. Aircel is targeting college and university freshers with its new Campus Special Plans. At a pocket friendly price of Rs 149, students will get to have everything from free SMS to data plan. The new plan will definitely help students to make new buddies in college without putting strain on their pockets. The Campus Special offers a special tariff of 5 paisa per minute for local Aircel to Aircel calls for 333 local and STD minutes, 1 GB data and 2000 SMS for 3 months at pocket friendly price of Rs 149. 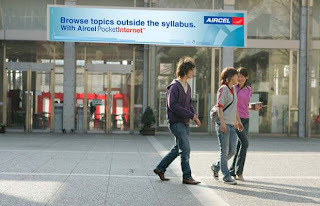 "Aircel's new 'Campus Special' plan allows the youth to savour the irresistible platter of services - talk, text and surf. Staying connected is the foremost need of today's youth and this plan caters to just that,” said Anil Gupta, circle head, New Delhi and Haryana, Aircel in The Mobile Indian report. To avail the offer, students of all the colleges and universities in Delhi and National Capital Region (NCR) need to show their college identity card. So what do you feel about these plans, and if you think Aircel has taken a good step forward then comment your reviews. KIIT - Best BE/B.Tech Engineering College in Delhi that provides courses like Bachelor of Electronic and Communications, BCA, MCA, BBA .KIIT is best College for taking Admission for Higher Education in Gurgaon. Thanks @KIIT Gurgaon when does your admissions start.? and I think it would be a great start in career at gurgaon. videocontelecom offers new Customers the proposition will be available on Plan voucher (PV) priced at Rs 76, offering All Local Calls at 25P/min only for 6 months including Rs 63 Talk time; 1050 MB data for 3 month and 100 SMS free/day, with first 2 SMS of the day chargeable at rack rate only in Haryana. Rating For All Games !!! !